Personalized Green Daisy Dog Collar Made in the USA by Yellow Dog Design, Inc. 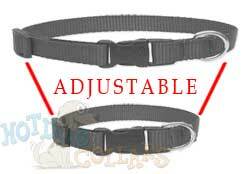 This is our 2nd order of these collars. They are so fun and well made. We get compliments on them all time. Plus, they have our pet’s name and our contact info! Last but not least, they are a great price. We’ve sent many folks to this website when they ask. This collar is so cute and well made. I bought these for my miniature Dachshunds. I wish they were a little smaller and thinner... Maybe like 5/8 instead of 3/4 wide and sized a bit smaller too... Like 9-13 in. They fit my 10 lb dog but are a bit big on my smaller pup. I could not walk them on leashes as they would slip off. I love the collars even though they could be smaller. I love this collar. It is perfect for my little Pixi! I have ordered multiple times from you guys and have been so pleased every time! Your products are amazing and the service is terrific! You guys are amazing! Thanks for all you do! The collar quality was fantastic. I was worried about the plastic clip but it was great. The weight is great for smaller dogs and the print quality was excellent. Very visible and no bleeding. Love the collar that we purchased for Laci... Came out better than expected! Name and phone number both show! LOVE THE VISIBILITY OF MY DOG'S NAME! I love this collar! My dog's name is Daisy, so I thought it was fitting to have a daisy collar ;) It seems that she likes it too, since it's nice and wide, it seems comfortable to her. I get a LOT of compliments on her, and her collar, when when we're out walking.